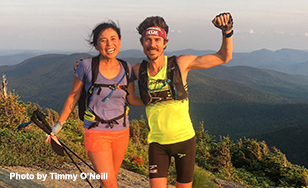 Scott Jurek '96, '98 moved fast last summer, when he broke the longstanding time record for completing the Appalachian Trail. But not too fast to savor the experience along the way. "On a journey like that, every day there's just so many amazing things," said the vegan ultrarunner. Consider the red eft salamander. "It was really cool because I would see those all the way from Tennessee and Georgia and North Carolina all the way up to Vermont," said Jurek. "A lot of people assume I was just going so fast that I wouldn't be able to see and experience things like that." He recalls watching a sunset with his wife and some friends from a ridgetop in the Mahoosuc mountains of Maine after a particularly rough day on the trail. "It's so rugged, and you're going through bogs, and a rock-strewn trail, and roots all over the place," he said. "That moment was super-special," He completed the 2,189-mile journey from Georgia to Maine in forty-six days, eight hours and seven minutes. It was the latest among a long list of records he has set as one of the world's top ultrarunners. Probably his greatest achievement is winning the Western States Endurance Run, the oldest 100-mile trail run in the world, seven times. An average day on the Appalachian Trail consisted of meals on the go while hiking and running. His wife Jenny, along with old friends and new acquaintances from the running community, provided support, meeting him every 15 to 20 miles with supplies. With a goal of 50 miles a day, he'd focus on taking just one step at a time. "That's always been a key thing for me: trying to get back to the present moment. Sometimes that's focusing on the simple things, such as putting one foot in front of the other." Jurek discovered his love for distance running while at St. Scholastica. A native of Proctor, he'd never ventured far from home before attending college. "I hadn't traveled the world, I hadn't seen things. I was able to learn a lot about the world through my liberal arts education," Jurek said. "I think that's something St. Scholastica gave to me, more than just a physical therapy degree or background. I think having a wide range of instructors with diversified backgrounds is really key. I've always gravitated toward a professor like Doc C (Gerald Cizadlo), who had the chain attached to his wallet and a motorcycle sweatshirt — to me, it wasn't just this stuffy liberal arts education." He plunged into the college experience, relishing the opportunities to learn new things and meet people with unorthodox ideas — and hobbies. "I really enjoyed the eclectic souls and individuals that walked the campus," Jurek said. "That was something in my off-campus time too — how I got into ultrarunning and started hanging out with people who opened me up to different viewpoints. I think that's important in an education no matter where you go." Jurek's passion was Nordic skiing, and he took up long-distance running to stay in shape during the off-season. He fell in love with the sport, and trail running in particular. "It's been a great vehicle for self-exploration, and finding out what I can do physically and mentally," he said. "There's obviously the joy of being in the mountains and the woods, which I find quite therapeutic, but I think more than anything...it's a way to really find out what I'm made of." Home page photo by Luis Escobar.